I have a 97 Honda accord and my right radius rod that is under the transmission is lose because the front assembley screw / washers that holds the rod fell off...anyone know where i can find those screws and the washers or a brand new radius rod? 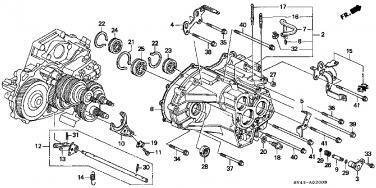 Have a question for you..does your car have an AT./ and do you see your part in this picture somewhere's.? If we are talking about the strut rod busing....many of the replacement kits come with the washers and sleeve....you might pick the nut up from the dealer.